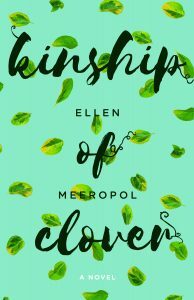 Ellen Meeropol’s third novel, Kinship of Clover, explores difference, interconnectedness and the potential for new life to grow in the ashes of tragic loss. Her characters are linked together like winding tendrils leading back to one night when the commune they were involved with held a naming ceremony in a forest: two children died and the community was blown apart. Eleven years later, Jeremy is a botany major at college and his father has been recently released from prison. The novel traces how Jeremy struggles to manage the trauma of that tragic night as it continues to reverberate through him, manifesting during moments of particular stress in the hallucination of vines that grow from inside his body out into the world. After one of these disturbing episodes, Jeremy reluctantly takes shelter at his twin brother’s apartment in Brooklyn and becomes involved with a group of environmental activists struggling to agree on how to make real change and the most long lasting political impact. Jeremy also starts to make links with his past as he reconnects with Sam, who was there the night of the commune tragedy, his daughter Zoe, now finding her way into adulthood as an independently minded young woman and wheelchair user, and his mother Flo, a rebellious former political activist now sliding into dementia. Flo has been a fighter all her life, but she can’t fight Alzheimer’s. She has reveled in her reputation of being opinionated, uncompromising and insistent and has mothered Sam rather like a vigorously growing and invasive plant. She has a desire for self-definition and expression that has rather blocked out the light for her son and left him a middle-aged man unable to locate his own needs. Meeropol is at her best when her characters articulate their felt experience of losing hold on reality. The devastating moment by moment loss of lucidity and clarity of thought that Alzheimer’s creates seems to heighten in Flo an exquisite awareness of the sensual pleasures of thinking and talking: “ [H]er thought felt good…if she could just hold onto it long enough to form it into words and push it through her mouth” (87). When Jeremy attends his first environmental lecture “the steep pitch of the room played havoc with his balance, pulling him forward until he was poised to fall into the drab empty space” (41). The progression of both Flo’s dementia, and the rising up of childhood trauma in Jeremy have the effect of dissolving the border between past and future, revealing long buried emotions, secrets and current relationship irritations some threatening to explode into violence or psychosis. But like the clover of the title which thrives best in depleted soils, Jeremy takes his emotional trauma, buried so deeply inside him, and with it lets the plants themselves lead him on a personal journey of healing. Ros Howell is a registered Dance Movement Psychotherapist. She facilitates a group for mothers, and their preschool children, who are seeking asylum in London and is preparing to work with women experiencing postnatal depression and anxiety. 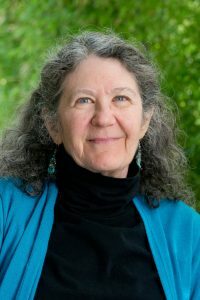 She recently co-lead edited the inaugural edition of the Journal for Mother Studies.